I finally completed another video mod for a console of mine. 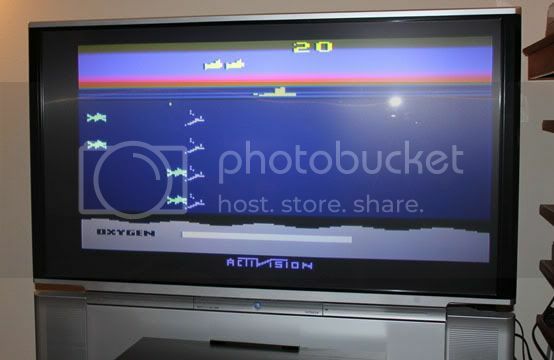 The Atari 2600 has been high on the list of consoles to modify for higher quality video output. It was my first home console, it has a lot of memories tied to it, and it also has a good library of games. The first modification I tried was made by 8bitdomain. This was a rather frustrating experience as I had to actually perform some maintenance to his circuit after he sent it to me. I had to flow some of the solder to get the color back in the S-Video output. Installation of the chip was a snap, but the color output was too saturated. The images were smeared, and I was unhappy. Enter the Longhorn Engineer. I followed his work in developing the mod - even bought a mod for the Atari 5200 a couple of years ago. The 5200 had a problem with vertical bars on my display. He has since improved the mods. I bought an improved mod - this time for the 2600 - and went to work. 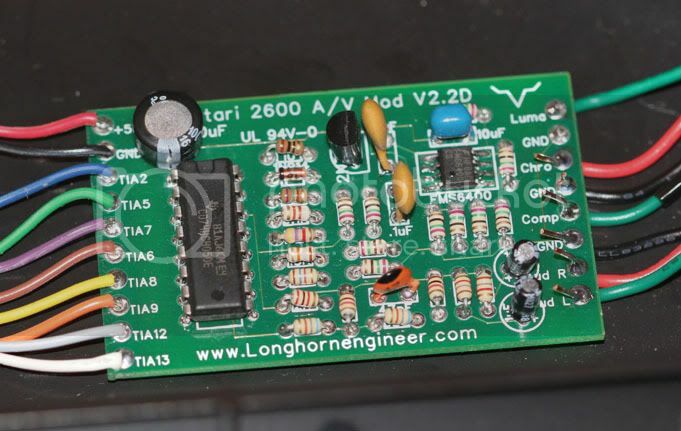 Longhorn's mod required that you solder various wires (left side of picture) to the Atari 2600's motherboard (not pictured). Once you soldered those into place, you could use the wires on the left side to hook up your video connections. The drill bits pretty much chewed up and spat out the 30 year old brittle plastic. I pushed the project to the side for months. 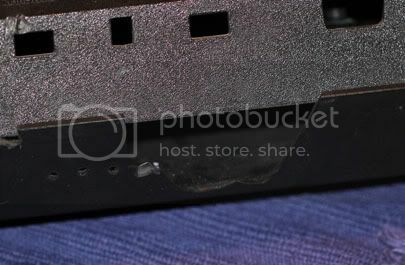 I was pretty sure I couldn't make it look that great as it would take some major putty/glue work to restore the case *plus* I had to finish the holes. Around the time I was gearing up for the Houston Area Arcade Expo, I elected to acquire a replacement Atari case and complete the mod. The Longhorn Engineer had updated his guide to mention picking up Forstner drill bits and using them on the case. I was so glad I checked his guide for giving it a second try. I purchased the bits at Lowes, came back, did the drilling, and it worked perfectly. I mounted the video plugs and closed up. I did this last night. Unfortunately, it had issues after I closed. After some additional soldering work today (I had a cold solder joint), it is up and running. I purchased the mod way back in April and have been too busy to take the time to finish it up. I am happy now that it is finished, however it looks like there are several tweaks to it to help improve colors. Regardless, it is working now. I will probably just use it this way for awhile, see how the mod evolves, and then make the 2.0 tweaks down the line. Feels good to finally get the Atari updated! Now I can enjoy some games. Bill, are you thinking what I'm thinking? This might be a good solution for getting decent 2600 footage. I wouldn't be able to do such a mod in the time we need. Emulation is fine (no filters), as is straight RF (which I can do now, though actually I can do pure composite using an Adam and the Atari 2600 expansion). 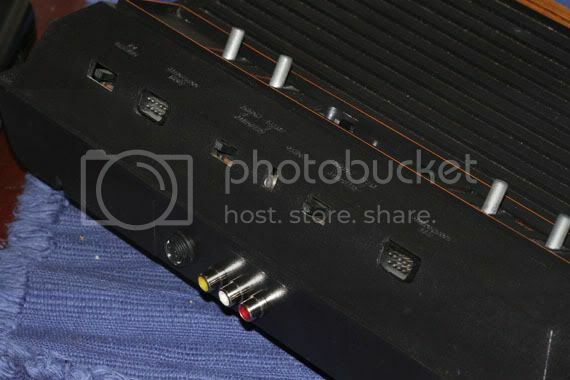 At some point I will have an S-video Atari 7800, but probably not until the 2010 timeframe. I still have to perform an upgrade to one of my Intellivision II's. I still have the kit for that. I can always grab it via emulation as well. I doubt anyone but an expert would know the difference anyway. Well, unless the emulation has issues, there won't be a noticeable difference on film. Frankly, the highest possible quality is best for that, authentic signal or not. It's funny, but today over at AtariAge someone was talking about the Intellivision II composite mod I have. Apparently it causes some ghosting. That's always the problem with these types of mods - often the colors might be a bit off or there is some other visual anomaly. Getting a properly tweaked modern output on a classic console can often be very, very difficult, and you would think that it really wouldn't. Of course this only applies to consoles that don't already have ports other than RF out. Of course some consoles - and computers - have cleaner RF than others. Some, like the ColecoVision and Timex Sinclair 2068, for instance, have VERY dirty RF output. I remember my VIC-20 having an unbelievably poor RF picture - snow & lines all over the place. The NES looked just fine on the same TV. I submitted a long reply earlier, but it gave me a notice that the post had to be approved. Anyway - that 8bitdomain guy made the Intellivision mod, and he is the same guy I purchased that Atari 2600 A/V mod that I discarded. It was flagged as spam for some reason. I approved it. I'll have to check to see if mine is an 8-bit domain one. It just might be. I do have a Bally Astrocade multi-cart from them that I'm happy with. Hey Chris I found this googling for 7800 stereo mods. Nice little review. Anyways, I would try removing the 47pf cap and the 680ohm resistor right below the 47pf cap. The 47pf cap is the orange one with the black on top. After that bridge the two contacts where the cap used to be. This might solve your color issue. Also, do you mind if I link this page to my website? Sorry for my late reply. Go right ahead and link!